Twenty three year old Isaac is an ambitious young entrepreneur who has worked as a professional chef for seven years. His focus is contemporary English fine dining and he firmly believes in using locally-sourced, seasonal ingredients. A natty little label tied around our menu informed us that the evening’s fare was inspired by the “agricultural bounty of the Sussex Downs and beyond”. 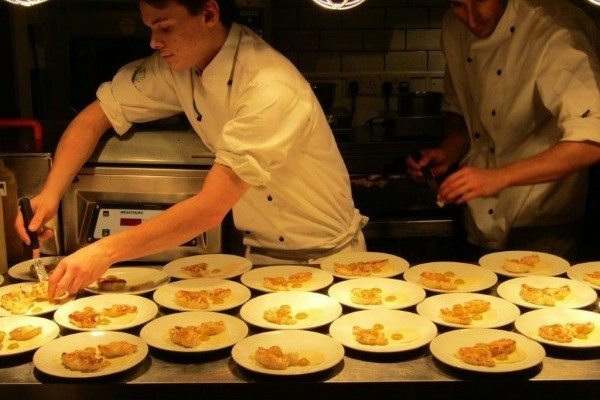 Isaac heads up a dynamic young team of gifted individuals and is very ably supported by his sous chef George, chef Nima, Kieran the kitchen hand and restaurant manager Sophia. They describe themselves as obsessively passionate about food and invite guests to join them on an ever-evolving culinary adventure. Each week a new dish is added, ensuring that the menu is constantly changing. 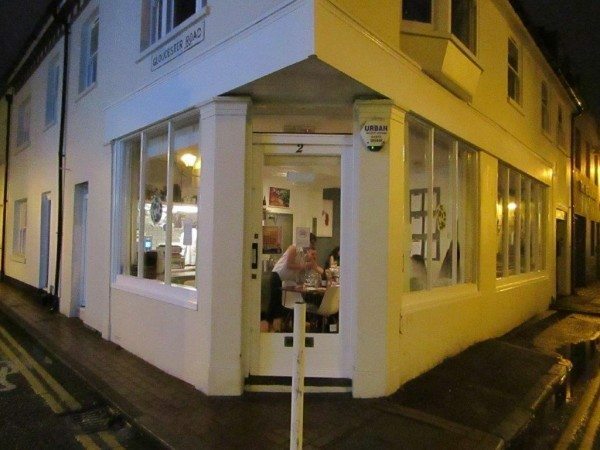 The restaurant is only open to diners on Fridays and Saturdays, the rest of the week the chefs are hard at work developing new dishes and preparing ingredients for the weekend. Isaac At is Isaac’s intimate thirty two seat restaurant tucked behind the North Laine pub just off the Level. The centrepiece of the restaurant is the open kitchen where you can watch your food being prepared. 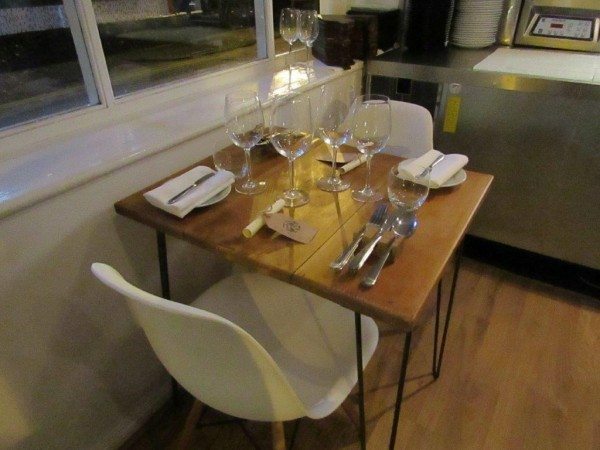 Apart from a couple of tables for two, most of the seating is at long, cosy, communal tables. I was a little anxious about sharing a table at first but, in fact, it was good fun and it was lovely to meet other like-minded foodies. Everything is quite snug, but the space is made to feel as big as possible with light coloured wooden flooring, white washed walls and minimalist furniture. My only niggle is that the chairs are a little on the flimsy side and tended to slide around on the highly polished floor, which meant that I felt a degree of trepidation each time I sat down. So, to those of a curvier persuasion, plant your bottom with care! 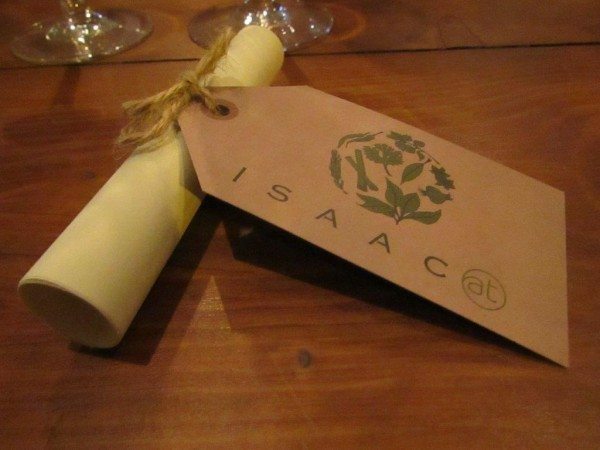 Rather than just feed you, Isaac and his team aim to offer a unique dining event that lasts all evening. Throughout the night the pass becomes a well-choreographed blur of deft hands doing myriad different tasks. Once the dishes are prepared they are introduced to the diners by one of the eloquent young chefs. A great deal of thought goes into the presentation as well as the composition of the dishes so everything we were served looked absolutely beautiful. Service was friendly, helpful and not at all snooty, Isaac wasn’t above pitching in to clear plates when needed. 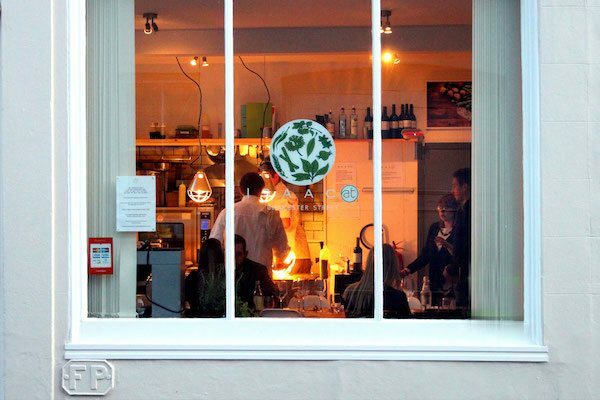 All drinks served at the restaurant are made in Britain and many are organic. We went for a bottle of the recommended 2013 organic Horsmonden dry white wine from the Davenport Vineyards in East Sussex, which was fresh and citrusy and quite delightful. 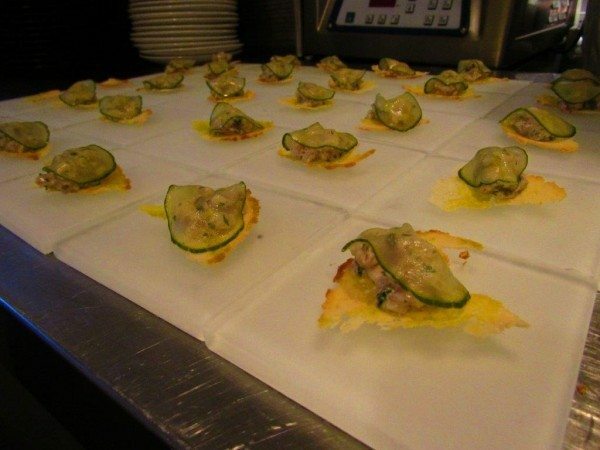 To begin with we were presented with a frosted glass tile adorned with a very pretty amuse bouche of mackerel tartare on a crisp, golden, sour dough croute, topped with a glistening, translucent, paper-thin slice of pickled cucumber. It was creamy, tangy and crunchy and a truly mouth-watering start to the evening! 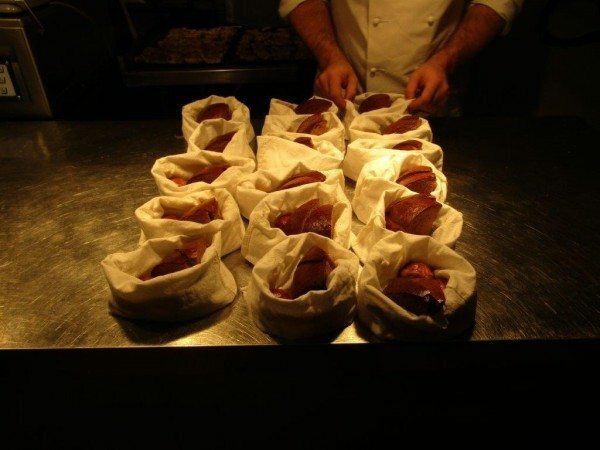 Then we were given immaculate white linen baskets filled with substantial wedges of treacle and stout sour dough bread and little individual caramelised shallot brioches along with a geometrically perfect cube of butter on a little square slate. The brioche was subtle and sweet and impossibly light with a delicate golden crust. The sour dough bread, in contrast, had a crunchy, glossy, mahogany-coloured crust and a complex yeasty flavour with a background hit of hearty stout. 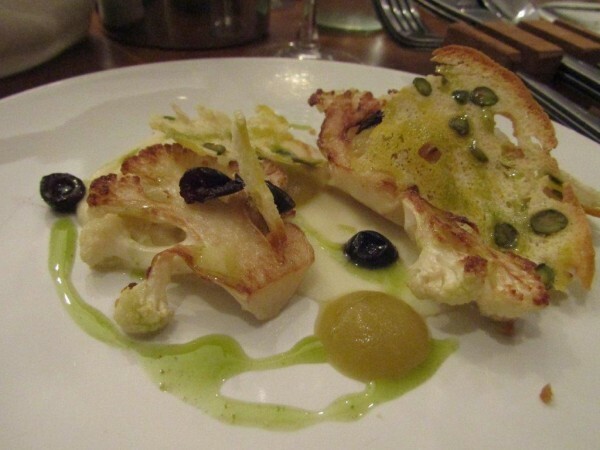 Next we were served baked cauliflower, smoked apple, sloe, pistachio and rosemary. The cauliflower was served two ways: as a chunky slice, which was beautifully caramelised on the surface but still satisfyingly fresh and crunchy, and a comforting, velvety cauliflower purée. 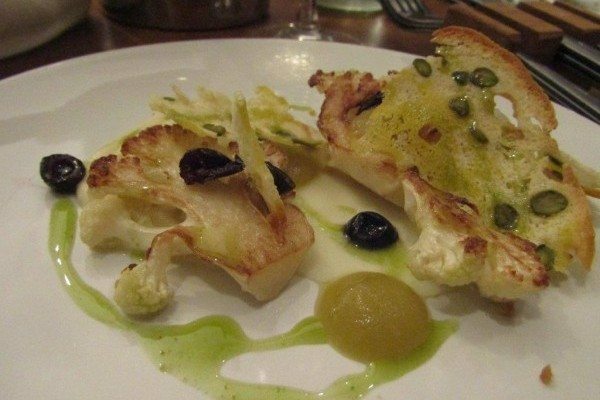 The cauliflower was accompanied by juicy, pickled sloe berries and smoky apple purée. Finally the dish was topped with a lovely pistachio croute and drizzled with vibrant green rosemary oil. It was sublime! Our next course was wild halibut, charred leek, smoked garlic and lemon. The beautifully fresh fish was light, delicate, and melt-in-the-mouth delicious. It was generously coated with a scrumptious crunchy, golden panko and chicken skin crumb. Underneath was a rich, silky-smooth, smoked garlic and potato purée. 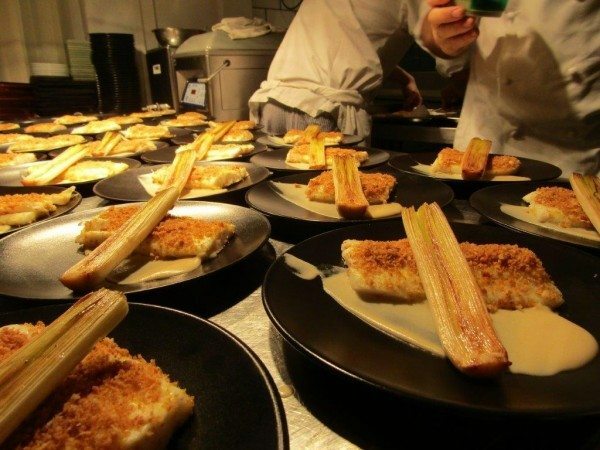 The white part of the leek had been halved along its length and delicately charred while the green leafy part had been reduced to a powder, which was sprinkled across the dish. The lemon dressing cut through the saltiness and added a lively citrus kick. Another glorious dish! 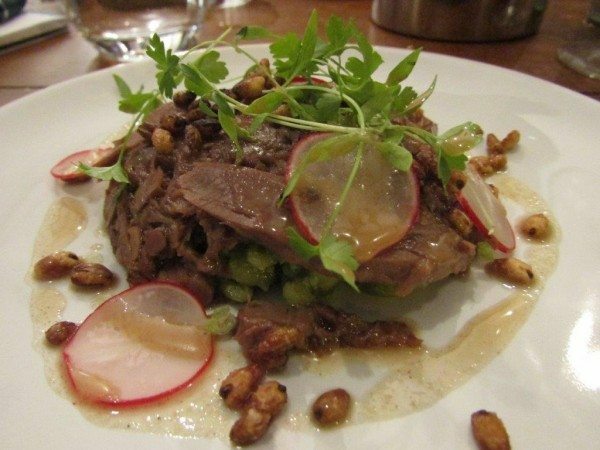 Our final savoury dish was oxtail terrine, pearl barley, hazelnut and parsley. The pearl barley was green with parsley and flavoured with Sussex Yeoman goat’s cheese, kohlrabi and shallots. On top of that was an incredibly rich, earthy, succulent oxtail terrine that had been warmed under a blow torch so that it was almost melting over the barley. The dish was topped with pickled radish slices, crunchy toasted grains and parsley cress. It was a fantastic end to the savoury section of the evening. With high fives all round, the chefs set about preparing the dessert courses. First we were given an apple and five ways honey sorbet. It was smooth, refreshing and not overly strong with honey. The taste reminded me of the smell of freshly sawn wood. 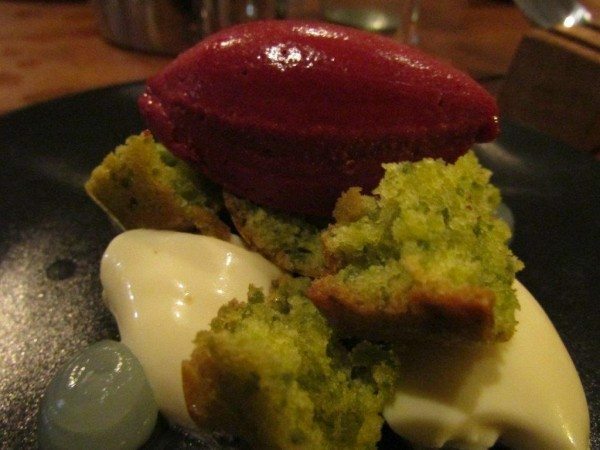 Then we were given Pistachio and rapeseed cake, panna cotta and blackberry sorbet. The cake was soft, sweet and nutty and the buerre noisette panna cotta was the smoothest, richest, most heavenly panna cotta I have ever tasted! The juicy sorbet and the bitter lime gel provided the perfect contrast. With dessert we shared a glass of Blackdown elderberry port, which was syrupy and smooth, and intensely fruity with a hint of smokiness. 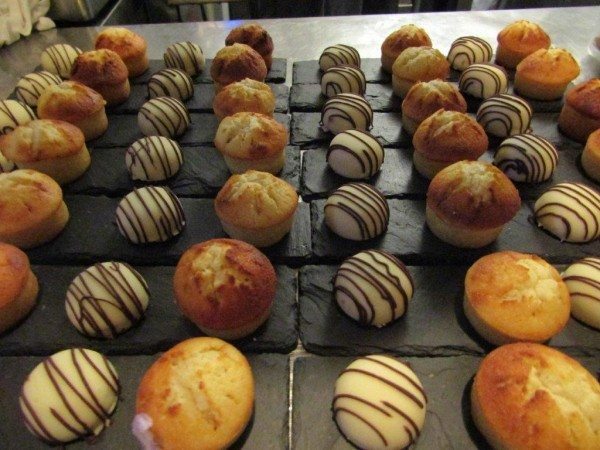 Finally, with our tea and coffee, we were served a little slate of petit fours. One was a little lemon and almond drizzle cake which was zingy, sweet and moist. The other was a white and dark Valrhona chocolate shell filled with the most exquisite raspberry and lemon thyme liquid centre. When discussing our favourite dishes of the evening with fellow diners we found that everyone opted for something different, which I thought perfectly illustrated just how consistently excellent the food was and the huge variety of flavours, textures and techniques Isaac had managed to incorporate. The evening finished with a well-deserved round of applause! If you really want to impress, you can book the three chefs for private dining events either at the restaurant or in the comfort of your own home.